Crude prices this morning are $43.98, having shed the gains the market put up yesterday. Crude opened this morning at $44.58, slightly higher than yesterday’s opening price of $44.35. 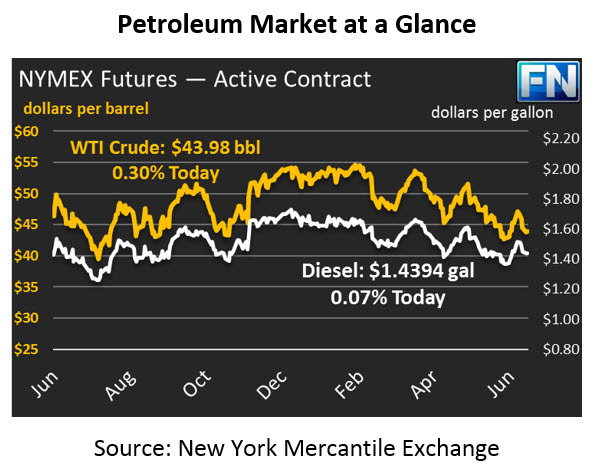 Yesterday the market fell to $43.65, before traders bid the price up to $44.84, closing at $44.40. Prices are now just under 1% lower than yesterday’s close. 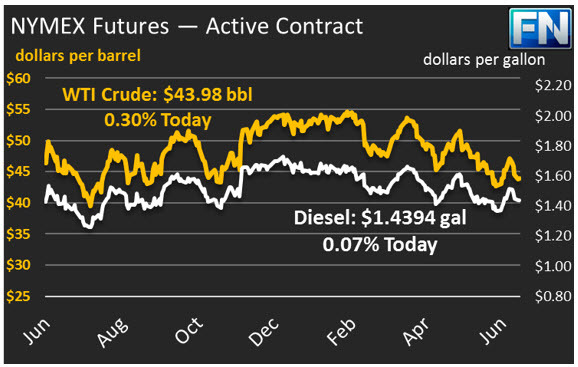 Diesel price are $1.4394, in line with yesterday’s early-morning lows. Prices opened at $1.4550, close to yesterday’s opening price of $1.4512. Like yesterday, prices have fallen lower this morning – the question is whether they will follow yesterday’s pattern of posting gains later in the day. Gasoline prices are $1.4834, more than 1% below yesterday’s close, a loss of nearly $.0175. Prices opened at $1.5040, bucking the trend and opening slightly lower than yesterday’s opening. Fundamental news has been lacking so far this week. Yesterday’s price action is being attributed to short covering, not a true move higher. Analysts at Goldman Sachs called for prices to drop below $40/bbl if crude stock draws end and rig counts continue their growth. Yesterday, OPEC announced that they had invited Libya and Nigeria to attend the OPEC meeting in Russia, helping to give prices their slight boost. However, Nigeria has already turned down the request, cutting off the market enthusiasm before it could begin.